It was an afterthought that prompted Becky Keep to ask the nurse practitioner to check five-week-old Jesse’s eyes. An observant grandma had commented that those baby eyes didn’t seem to be following normally. That last-minute request set the Keeps on a four-year journey that they never dreamed they’d be taking. 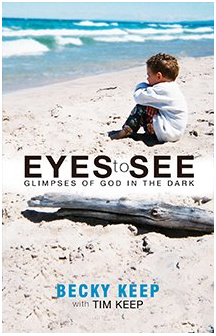 Eyes to See: Glimpses of God in the Dark by Becky and Tim Keep is the story of that journey. – The amazing way circumstances fell into place so that Jesse’s condition was discovered as early as it was. The chain of events was set in motion long before Jesse was even conceived. – The goodness of God to the Keeps through family, friends and their church home, wherever it was. – God’s way of providing an answer, e.g. a place to live, a job, often in the nick of time. – The discussion of divine healing. If there is one issue that people who believe that God’s healing power is available today grapple with it’s how do we explain when physical healing doesn’t happen. The Keeps went through the wringer here as people recommended a multitude of remedies, berated them for their lack of faith and scolded them for praying for healing “according to the will of God” insisting that this kind of prayer was “symptomatic of wavering faith, faith which should never expect to receive what it asks for” – p. 58. 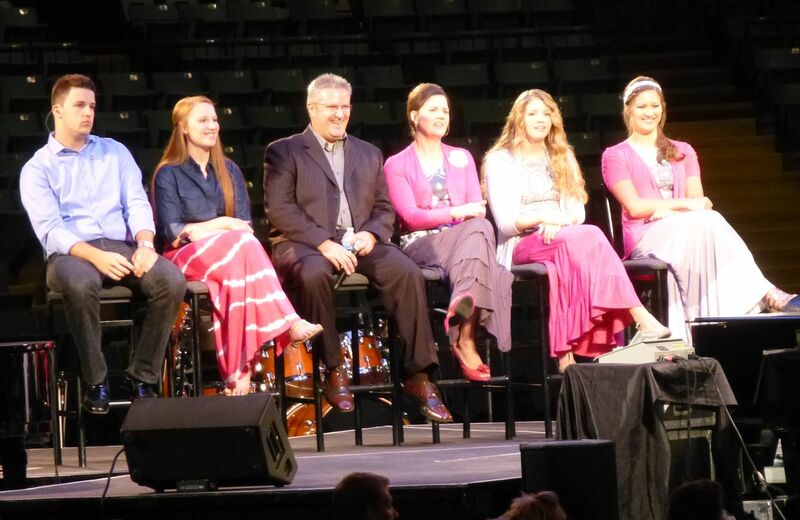 “’My Son, I don’t want you to worry about my intentions toward Jesse or My will for your family. Nor do I want you to keep measuring your faith. What I want you to pray for right now, and the only thing I want you to pray for, is for My glory …. I want you to pray that through this difficult trial, men and women will see the embodiment of My life, My peace, My joy and My enabling grace” – P. 71. Becky Keep tells the story with the skill of a seasoned storyteller, drawing us into their family’s life and experience through personal memories and anecdotes. There is also a section of black-and-white photos. 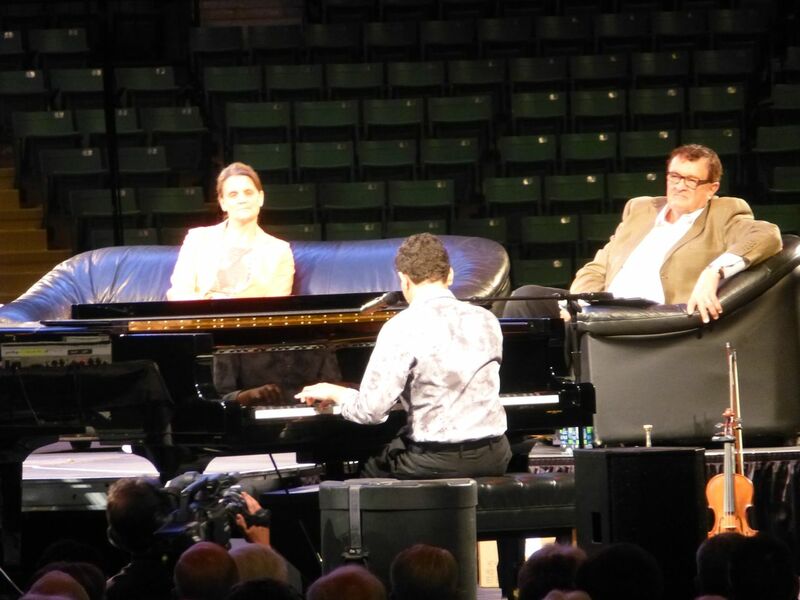 The story has a happy ending, or maybe I should say ‘continuation.’ Jesse appeared with his mom (along with the Collingsworth Family: Kim Collingsworth, mom of that musical clan, is Becky’s sister) at this year’s Gospel Music Celebration in Red Deer Alberta (July 13th). Jesse, now 15 years old, played to thousands, talked about his musical ambitions, and later signed copies of Eyes to See. This is a book anyone, young or old, could read and enjoy. It would be especially meaningful for people struggling with health issues, particularly in their youngsters. It is a story of hope in God who gives the best healing of all—the healing of hearts. 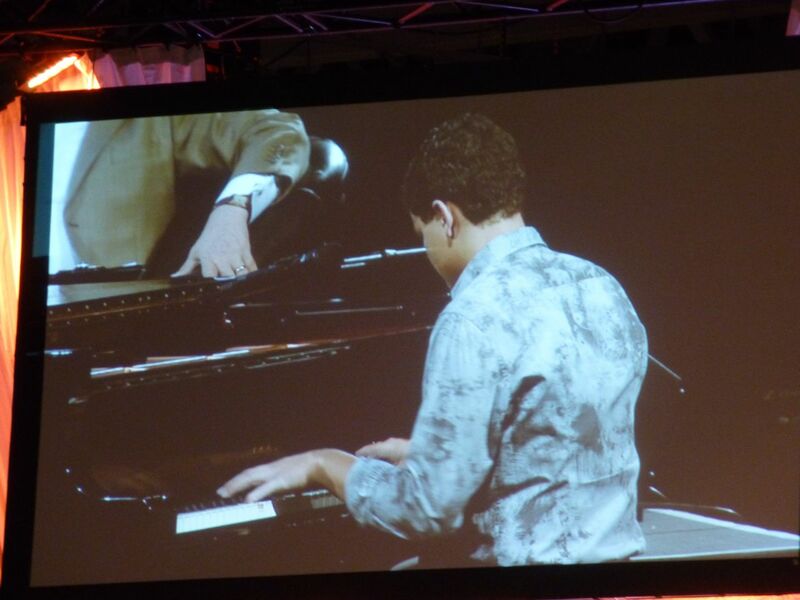 …as Jesse Keep plays piano. His mother, Becky Keep (author of Eyes to See) and weekend organizer Wayne Dyck look on.